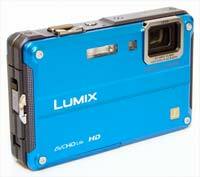 The Panasonic Lumix DMC-FT2 (also known as the DMC-TS2) is the successor to the year-old DMC-FT1. This waterproof, shockproof and dustproof digital camera is substantially tougher than its predecessor, being waterproof to 33 feet (10m), shockproof from a height of up to 10 feet (2m), and now newly freezeproof to 14° F (-10 °C). A protective silicon jacket is included in the box to help protect the DMC-FT2's exterior from scratches. The Panasonic FT2 also offers an upgraded 14.1-megapixel sensor, faster Sonic Speed auto-focus system, a shutter release time lag of just 0.005 second and a thicker cover panel for the LCD screen. Other key features include a 28mm wide-angle 4.6x optical zoom lens, a 2.7-inch LCD screen, high-definition movies, and new High Dynamic and Happy modes. 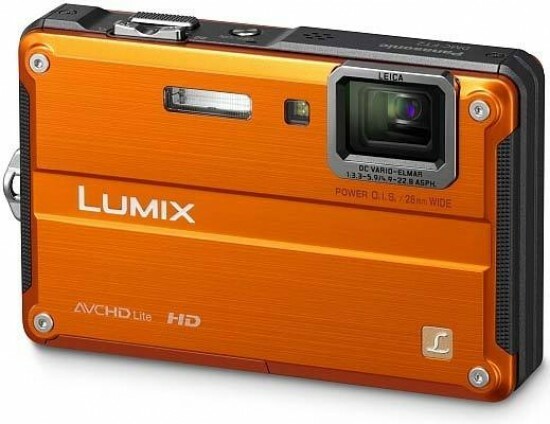 The The Panasonic FT2 / TS2 will be available in silver, blue, orange and yellow. Time waits for no man, especially in the world of digital cameras, and so it is that the DMC-FT2 arrives on the Photography Blog test bench barely a few weeks after its predecessor, the DMC-FT1. As the two cameras are so similar, a lot of the comments that we made about the FT1 will be repeated here. Available in the shockingly bright blue of our review sample, with corner screws incorporated into its brushed metal front and back plates, from the outset Panasonic's solidy-built dust, shock, waterproof and now freezeproof FT2 compact feels up to the challenge of some rough treatment. You can't, for the most part, fault the Terminator-like build quality, which also includes rubber padding, reinforced glass and carbon resin inside the camera. In addition to the new freezeproof quality, the DMC-FT2 also has a thicker protective cover over the LCD screen, which thankfully doesn't protrude too far out from the back of the camera. The final level of defence is the clear silicon sleeve that's now supplied as standard in the box - fit this and you really can rest assured that your kids won't be able to destroy your beloved camera. Well, almost. 14 megapixel still photos aside, the FT2 also includes the ability to capture HD quality video up to a maximum 1280x720 pixels at 30 frames per second in the AVCHD Lite format (better, apparently for replaying footage on your telly) or Motion JPEG (fine for the PC and Internet), with a dedicated Record button usefully provided on the rear. You can also now divide video into two sections to shorten or delete clips directly in the camera and also grab a still image from a video, something that we've seen previously on several Samsung cameras. The Panasonic FT2 has an internally folded zoom mechanism, so there's no danger of the lens barrel receiving a direct, potentially devastating, knock. As with the FT1, on offer here is a respectable 4.6x optical zoom, starting at a wide-angle 28mm and running up to an equivalent 130mm at the telephoto end, so proving as useful for group portraiture as photographing landscapes. The only downside of this is the lens' positioning towards the top right hand corner of the faceplate, meaning that unwanted fingertips can stray into the frame when gripping the camera in both hands to take a steadier shot. Plus there's no automatic lens cover to act as a further barrier to the elements, meaning that the protective glass acts as a magnet for fingerprints. As expected, to prevent image blur from camera shake, there is optical image stabilization provided, now utilising Panasonic's new upgraded Power OIS, rather than the older, less effective Mega OIS system. The Panasonic Lumix DMC-FT2's tough guy image is dealt a slight blow by the smallish and occasionally plastic-y controls. You imagine it would have chunky buttons to match the chunky exterior so that the camera can be operated with protective gloves on. Instead you get the regular miniscule offerings we're all well used to that require gloveless fingertip precision. Only the tactile shutter button with its textured finish is really suited to gloved operation. Panasonic hasn't totally parted company with convention, and most of what's here will be familiar to even the most casual of digital camera users. The halfpenny-sized shooting mode wheel at the rear that once again includes the common scene and subject-recognising iA (intelligent Auto), thus benefiting the majority of users who want to point and shoot rather than make manual adjustments. Showing its mettle, also ranged around the dial are regular auto, plus dedicated sports, snow, beach and surf options plucked from the 26 additional scene modes provided which share their own setting. There are two new scene modes - High Dynamic helps to capture a scene with moderate exposure, even if it contains both bright and dark areas, while the humorously named Happy mode makes both stills and video more vivid. The last option on the dial is a clipboard mode for taking quick reference low resolution snaps of maps, train timetables and so forth when on your Arctic trek. The clean, boxy faceplate of the FT2 features the regular trio of the aforementioned lens, narrow window for the built-in flash plus a self-timer/AF assist light indicator, the latter two being noticeably bright when used at close quarters, and necessarily so when shooting at night. A new LED Light option helpfully turns on the white self-timer/AF assist light when filming video or shooting stills to help out in darker conditions, useful underwater, although it's not particularly powerful. On the Panasonic FT2's top plate we find a built-in speaker, on/off power button just behind the integral microphone (complete with Dolby Digital Stereo Creator for higher quality audio) and to the right of this a chunky rocker switch for operating the zoom. Behind this again - looking bizarrely like a stereo microphone - is a rectangular shutter release button with ridged top, thereby helping wet fingers find a point of purchase. Power on is almost instantaneous, which is just what you want if taking a plunge. The action of the zoom is smooth and steady, gliding from maximum wideangle to extreme telephoto in just under three seconds. Since the lever for its operation is positioned just in front of the shutter release button and of similar proportions however, I sometimes found myself taking a shot when I merely meant to merely adjust framing and vice versa. There's no such confusion when shooting video, as movie recording gets its own red dot of a button at the rear of the camera and, unusually for a compact in this price range, the full range of the zoom can be accessed when doing so; it doesn't merely stay put at the point it was when recording commenced. Between JPEG shots in regular single frame capture mode there's a wait of just over two seconds, which again isn't bad. The Panasonic Lumix DMC-FT2's auto-focus has been upgraded to the snappy-sounding Sonic Speed system, and in practice it was certainly quicker and more accurate than the older FT1. It's not infallible however, still being sometimes confused by busy scenes, but quickly re-framing the shot helps it lock on your desired target. With two thirds of the camera's backplate taken up by its toughened 2.7-inch, 230k-dot resolution LCD screen which self-adjusts brightness levels according to ambient light levels at the time, it's to the right that we find the familiar smattering of operational controls. The shooting mode wheel and video record button we've mentioned, positioned most prominently where they fall under thumb and forefinger. There's also a readily identifiable playback button and beneath this again a set of square-ish cross keys with menu/set at their centre. These again will be familiar to owners of previous Panasonic Lumix compacts, as they in turn provide a means of tweaking exposure compensation (+/- 2EV with an on-screen slide bar provided), adjusting flash options (auto, auto with red eye reduction, forced flash on, slow sync flash with red eye reduction and flash off), selecting macro setting for close ups (as close as 3cm) and/or self timer (and option of two or ten second countdown). A press of the menu/set button meanwhile brings up a trio of folders on screen for, in turn, still image capture, video recording, plus a third option of set up. The first folder sub divides into four further folders that run the gamut of picture quality and size settings along with the ability to adjust aspect ratio from 4:3 to 3:2 to 16:9. We also get intelligent ISO, whereby ISO can be capped at a maximum ISO400, ISO800 or top whack ISO1600. There's also the ability here to select incremental stages from ISO80 up to ISO1600 as one would normally. White balance can also be adjusted courtesy of these sub folders, faces can be 'registered' with the camera in its face recognition mode (or this function can be turned off entirely), plus the colour mode can be altered from the default of 'standard' to neutral, vivid, B&W, sepia, cool or warm. Intelligent Resolution is a brand new feature that's provided by the FT2's upgraded Venus Engine HD II engine. When turned on, the camera automatically removes some of the image degradation caused by either the digital zoom process or during high-sensitivity shooting, enhancing the edge detail to make the subject clearer and smoothing softer areas such as faces. These enhancements apply to both still and moving images. Alternatively, Intelligent Resolution has a second option called i.Zoom which extends the camera’s zoom by approximately 1.3x while maintaining similar picture quality, providing a total zoom of 6x if used. Dipping next into the video recording folder we find the ability to adjust quality dependant on end use and swap between AVCHD and Motion JPEG compression options. White balance and a reduced range of colour modes can also be accessed when shooting video, and it's here you can deploy the wind cutting option when filming video outdoors. The third main folder - for 'set up' - gives access to five sub folders and it's here that LCD brightness can be manually adjusted plus compositional guides and on-screen histogram implemented if so desired, as well as removable SD/SDHC/SDXC card or internal memory formatted. The remaining two buttons at the bottom of the Panasonic Lumix DMC-FT2 back are for the self-explanatory display and the less immediately obvious 'Q.Menu'. A press of the latter 'Quick Menu' option brings up a toolbar across the top of the LCD screen, allowing the user to quickly tab through options for adjusting AF mode, white balance, still and video quality and the ilk. Basically, these are your key settings at a glance, saving the time required to dip into the menu folders mentioned above. Subsequent presses of 'display' meanwhile turn off the otherwise constant onscreen icons and shooting info to provide an image clear of distractions, and/or call up a nine zone compositional grid on screen for those users practicing their rule of thirds. On the right hand side of the FT2 meanwhile, under a chunky, lockable cover we find ports for connecting the camera up to an HD TV set via an optional HDMI cable, plus a dual-purpose slot for regular USB/AV out. The base of the camera meanwhile features the familiar centrally-positioned screw thread for attaching the camera to a tripod, plus another chunky slide-open cover protecting the battery compartment shared with a vacant slot for SD, SDHC and new SDXC cards. According to CIPA standards, battery life is good for 360 shots from a full charge, a very slight improvement on the FT1. Certainly we were using the camera for a few hectic days before we got a low battery warning, which makes the FT2 an ideal candidate for that short high adrenaline holiday or action packed break.